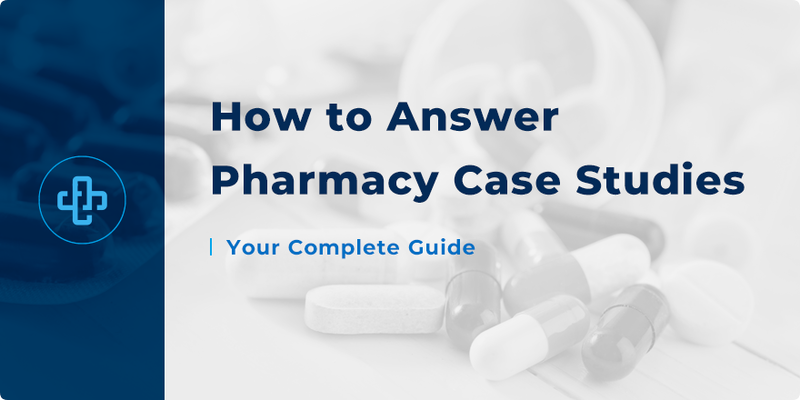 How to Answer Pharmacy Case Studies | Your Complete Guide! Whether you’re a student of pharmacy, medicine or nursing – you cannot underestimate the value of case studies. Case studies bring together the essential strands of your professional study. They are the means through which you analyse a patient, their condition, the medicines they are taking and the impact that additional medicines have on their circumstances. Studying subjects separately – whether it be pharmacology, pharmaceutical chemistry, pharmaceutics or clinical pharmacy – has value, but it’s though practicing case studies that bring the essential, relevant facts into sharp relief. Case studies are what elevate your status from general student into prospective clinical professional. The more case studies you review, the more rounded your knowledge becomes. Your critical thinking skills become more refined and more focussed. The link between chemistry, how it translates into a meaningful pharmacological impact, and how these twin forces inform your real-life clinical judgement, suddenly begins to make sense. To begin with, case studies are challenging, difficult and can dampen your confidence. In time, case studies become enjoyable, insightful and a positive force that serves to nourish clinical judgement. It’s through persistence and hard work that you reap the long-term benefits of case studies. Knowing how to approach case studies, then, is important. With the wrong approach and an improper mindset, you’ll never extract the value that case studies bring. Review the case study more than once. Never rush into a case study, picking and choosing facts you understand. Instead, approach the case study with an open mind. Be prepared to accept that you might not know the answer straight-off. The study may require some careful consideration, time and reflection. Evaluate the clinical significance of each statement. If told that the patient’s blood pressure is 148/90, relate this fact to every other detail in the question. Is hypertension a side effect of any of the patient’s medicines? Does the presence of hypertension mean that the patient’s dosing is incorrect? Is hypertension a cause of a drug-drug interaction? Perhaps hypertension is not caused by any medicine but is instead related to the patient’s lifestyle. In other words, you need to approach each statement from a multi-dimensional perspective – reviewing every possible angle and dismissing those angles that cannot possibly be true. Whether the patient is a child. Dosing is lower in children. Many medicines cannot be administered to children (think of aspirin and tetracyclines, for example). Older patients are more likely to experience side effects. For example – CNS effects, such as drowsiness or dizziness, are invariably worse. Older patients are more susceptible to infection, too. The risk of bleeding increases too, a factor that should inform your judgement of anticoagulants, such as warfarin. Age and the onset of biological change. Female patients over the typical menopausal age may be taking bisphosphonates to ward off (or treat) the onset of osteoporosis. Male patients over of the age of 40 produce less antidiuretic hormone, meaning they urinate more. How senescence impacts drug metabolism. Older patients metabolise drugs at a slower rate than younger patients, impacting their adverse effect profile. Of course, these are just some of the factors you should consider. At this point, we must appreciate why age is, when evaluating case studies, is an important consideration. The relationship between past disease and current treatment is important. Understand diagnostic parameters. As a prospective clinical professional, you must understand the various diagnostic factors at play. For example – sodium, potassium, white blood cell and cholesterol ranges; what is normal, what are considered low values and what high values mean? Understand the relationship between these factors, the medicines the patient is taking and the how their underlying disease impacts both factors. For example – proton-pump inhibitors reduce gastric acid levels. Because ketoconazole is best absorbed in acidic conditions, proton-pump inhibitors impact absorption and therapeutic efficacy. High gastric pH also reduces metabolism of essential nutrients, such as vitamin B12. Know side effects and drug interactions. It’s challenging to learn the major side effects and drug interactions. It doesn’t come overnight – it takes time. That’s why studying pharmacy case studies is important; they give you the opportunity to apply the learning you’ve done so far and extract the detail that you have yet to learn. Take two minutes to revise our compilation of major side effects. Build your knowledge of side effects over time. Often, knowing the drug’s mechanism of action is enough to inform your judgement of either potential side effects or drug interactions. For example – knowing that opioids, such as buprenorphine, causes respiratory depression should trigger alarm bells if the patient is co-prescribed another medicine, such as alprazolam; a benzodiazepine which itself causes respiratory depression. Practicing pharmacy case studies is, then, very important. We have developed over fifty case studies for you to practice. These case studies cover just about every aspect of clinical pharmacy – major organ systems, diagnostics, blood test results, side effects and drug interactions and the essential clinical facts you need to know. While they are not a complete solution, they serve to substantially build your knowledge of pharmacy and go on to help you pass your next pharmacy exam. Check back to our pharmacy blog soon for even more great study tips to help you pass your next pharmacology exam. Also, take a few seconds to join our newsletter (above) – where you can receive all the latest facts and study tips direct to your email.